K9 Select Beef Liver Flavored Melatonin 1 mg 180 Chewable Tablets, 180 Servings. Note: this product is not available for shipping from our warehouse in Canada. Orders to Canada containing our 1 mg beef melatonin will be shipped from Arizona. Now in a 1 mg tablet! Each bottle contains 180 chewable tablets of 1 mg melatonin in a beef liver flavor that dogs love. Melatonin is naturally produced by the body in the pineal system and supplementing with melatonin can be highly beneficial. Melatonin is a well known antioxidant and research has indicated that Melatonin can support the endocrine system in dogs. 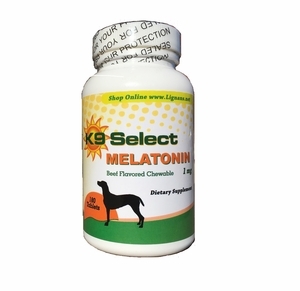 Melatonin can also be used to help calm dogs with heightened Cortisol (stress hormone) levels due to separation anxiety, fireworks, thunderstorms, Canine Cushing's Disease, and other stressful events. Melatonin is known to inhibit two enzymes needed in the production of cortisol (the stress hormone). Melatonin blocks aromatase enzymes and reduces hydroxylase enzyme. This effectively lowers heightened cortisol levels in dogs with Canine Cushings Disease or dogs experiencing elevated cortisol levels due to other types of stress. Whether the stress is a result of Cushings or a specific situation, reducing the increased stress hormones can help reduce anxiety. Melatonin is often used in conjunction with lignans to help lower cortisol levels in dogs with Cushing's Disease. This protocol was developed by the University of Tennessee, where multiple studies found that Lignans and Melatonin each inhibit two different enzymes needed in the production of Cortisol. Combined, lignans and melatonin can be the basis of an effective approach against the symptoms of Cushing's. Many of the symptoms of Cushings Syndrome are a result of elevated cortisol levels; therefore managing these hormone levels can aid in managing the symptoms. It is often believed that melatonin is used to help dogs with Cushings sleep better. While this may work in some cases, the primary function of the melatonin treatment option is to reduce cortisol levels, which helps manage heightened stress hormone levels in dogs with Cushing�s, thus aiding in controlling the Cushings symptoms. Note: Always consult your physician or veterinarian before taking melatonin for yourself or your dog. According to Dr Jack Oliver, DVM, you should not use a rapid release melatonin or a timed release melatonin. Use regular melatonin. All of our melatonin products fit these criteria. Give 1-3 tablets every 12 hours for dogs under 30 lbs. 1 mg (1 tablet) of melatonin every 12 hours may be recommended for dogs 10 lbs or less, or for those who want to give their dogs very low doses of melatonin. It is always recommend to consult your veterinarian on dosage suggestions.